We have witnessed such an occasion in recent days. The shooting at Sandy Hook Elementary School on December 14th stunned us, once again, with an inexplicable act of violence and evil. In the immediate hours afterwards, the most common response I heard in the news and on social media was a paralyzed silence. “No words, ” wrote one of my most eloquent and voluble Facebook friends. But people wanted to say something, to offer some expression of the terrible loss of life, the terrible violation of the sacrosanct holy land of childhood, the terrible knowledge that evil can pierce us to the quick and leave us wounded, naked, and lost. We wanted to console ourselves, to insist that goodness & love triumphs over malignity & hatred. In the absence of words, people began circulating images—beautiful, powerful images of grief-stricken Madonnas, of weeping Christs, innumerable incarnations of the fragile human form contracted and contorted, tongue-tied in an agony of grief. We were mystified—both in that inexplicable moment and for years afterward. One day, while I was reading the letters of poet John Keats, I received some small insight into this mystery. The young Keats would invest himself so entirely in the books he was reading (and in the lives he was living) he would become one with the creatures and emotions he encountered. Reading Spenser, he would hunker over and extend his arms in imitation of the “sea-shouldering whales” the master poet wrote of—watching the birds outside his window, he would imagine himself scratching and pecking in the gravel alongside them. This is what Basho, the 17th century haiku master, once said about lyric poetry. He left behind his life as a samurai warrior in order to become a poet, setting aside his sword to take up his pen, abandoning the pursuit of death to pursue life. To know a state is to know its opposite, and haiku invites poet and reader to experience both in the same instant of time with an intensity telegraphed by its brevity. And so the poem, like the sound of the cicada (most evanescent of creatures), celebrates life and heralds death. Here is the in-between space, the negatively capable niche, where Basho takes up residence and writes from. Haiku forbids excess. The poet has 17 syllables (or fewer) in which to say, not the un-sayable, but what can be said. There is no room for explanation, only impression. Haiku gives the fleet glimpse instead of exposition, a quick picture in place of a thousand words. The sparseness of haiku suits its subject—the finding of plenty in the midst of dearth, of presence in the empty fact of absence, of affirmation amid the cry of lamentation. Since there is no rice. And what are “these flowers” that substitute for food if not words—bright blooms we cannot eat, that won’t sate our human hunger, yet feed the ear and eye? And what are haiku but small bowls of roses offered on the altar of our mortality, momentary flashes of Being that enlarge and amplify our own? And so Basho wields his pen, a scalpel instead of a sword—his wounding delicate, surgical, survivable. Pierced by beauty, alive once and alive twice, we become more fully ourselves…heron and leaf, hamster and human, grieving mother and grieved-for child. Photo by vaRiax, Creative Commons license via Flickr. Post by Angela Alaimo O’Donnell, author of Saint Sinatra and Other Poems. 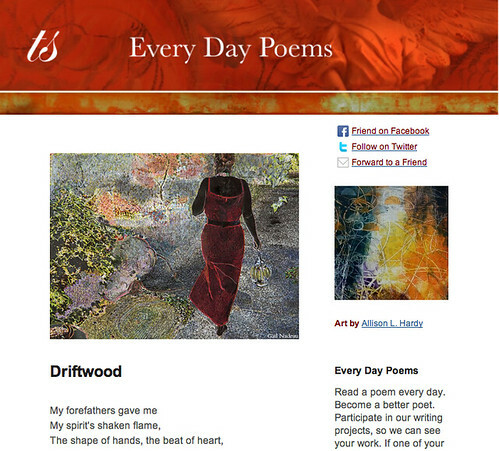 Lovely post, Angela, with beautiful examples of haiku. I could read Basho all day and never tire of him. I love the ideas of reading Basho all day . . . like eating one Bowl of Roses after another. Yes, very nice post, Angela. I also enjoyed my introduction to your work (as humbling as it was). Thank you, Christopher, for your gracious words. Coming from a Haiku lover such as yourself, they mean a great deal! This is beautiful and moving, Angela. Thank you for posting and sharing it! Happy New Year! Happy New Year to you, Christine! Thank you for taking the time to read–and to post these Good Words. I’m pleased and honored you enjoyed the piece.